If you are working (or even vaguely interested) in the scholarly communication space then you will not have failed to hear about the release of ‘Plan S’ last week. There has been a slew of reports and commentary (at the end of the sister blog “Most Plan S principles are not contentious”). Here’s another (hopefully useful) addition to the mix. The document identifies the key target as being: “After 1 January 2020 scientific publications on the results from research funded by public grants provided by national and European research councils and funding bodies, must be published in compliant Open Access Journals or on compliant Open Access Platforms.” There are 10 supporting principles to this statement. The plan is specifically engineered to force the hand of publishers and academics to really embrace (begrudgingly adopt?) change. Personally I welcome a bit of disruption. It will be no surprise to anyone that I consider the policies that arose from Finch to have failed. But this new development has, understandably, given a few people the jitters. First up, and if this is all you read remember this, Plan S is a statement of principle. Until we see the actual policies for our funding bodies everything is speculation. And while UKRI is one of the 11 13* funding bodies that has signed up to Plan S, it has said that the report from the review of the OA policy is unlikely to appear before the second half of next year. So the first thing to say is – don’t panic. We have some time. The second is that fully half of the 10 principles are not contentious – see the sister blog. A further two may have some implications for institutional administration and possibly for managing budgets, but are again fairly non contentious from an academic, and mostly even from an institutional, perspective. So we are down to three principles that need a little more unpacking. They relate to the retention of copyright and the ability choose where to publish. It is worth looking at these in more detail, and consider the information contained in the accompanying document “cOAlition S: Making Open Access a Reality by 2020: A Declaration of Commitment by Public Research Funders”. As it happens, we are already well on our way with many of these principles in the UK anyway. Let’s take a closer look. Authors retain copyright of their publication with no restrictions. All publications must be published under an open license, preferably the Creative Commons Attribution Licence CC BY. In all cases, the license applied should fulfil the requirements defined by the Berlin declaration. With my OA advocacy hat on I agree with this statement. There is no need for a publisher to hold full copyright over a work. They are able to operate in a commercial environment with a first publication right. Currently the system means that researchers must apply for permission to reuse work of their own if writing a new piece of work. There is a significant side income stream for publishers in relation to copyright ‘management’. Publishers claim they need copyright so they can protect author’s rights, but there appear to be few examples of a publisher protecting, say the integrity of an author’s work rather than the income stream from the work. And this is not the first statement of this kind. The University of California released on 21 June their Declaration of Rights and Principles to Transform Scholarly Communication which states as one of the principles: “No copyright transfers. Our authors shall be allowed to retain copyright in their work and grant a Creative Commons Attribution license of their choosing”. However as a person responsible for implementing policy within a large research institution I can see some issues that will need to be managed. For a start, currently, in the vast majority of cases, while researchers own the copyright of their work, they sign it over to the publisher of their articles. As it happens the retention of copyright is a fundamental principle of the UK Scholarly Communications Licence (UK-SCL) which allows institutions to provide a REF compliant green OA route while allowing authors to retain their rights. The alternative is to negotiate (as the sector) with the publishing industry to ensure that the publishing agreements that each researcher signs retains the author’s copyright. This would also require a huge advocacy and education programme amongst our community. For an excellent analysis of why there remains such a high level of confusion and misunderstanding about copyright amongst our academic community, I strongly recommend Dr Lizzie Gadd’s guest post to the Scholarly Kitchen Academics and Copyright Ownership: Ignorant, Confused or Misled? The requirement for an open license is also potentially an issue for some disciplines. While many science based disciplines are not concerned with a requirement to publish under a Creative Commons Attribution (CC-BY) licence, there are members of our Arts, Humanities and Social Science communities who only feel comfortable with a CC-BY-NC-ND license. It is the Non Derivative aspect of the license that is of greatest concern and has been the subject of considerable discussion. The “hybrid” model of publishing is not compliant with the above requirements. The nuclear interpretation of this statement is that funders won’t pay for hybrid at all. There are several precedents for this. Several UK institutions have stopped supporting payment for hybrid. London School of Tropical Diseases and Medicine are now restricted to fully open access journals only. University of St Andrews will no longer be able to pay APCs for articles via the ‘gold’ route in hybrid (subscriptions-based) journals. Their normal criteria is if the journal is listed in DOAJ. A 2016 analysis showed this is a common position. I have written extensively about hybrid mostly arguing against it. But I do support the position that we need to walk carefully here. In our analysis at Cambridge on what might be seen as a ‘progressive’ publisher we noted there is an extremely long tail of society and smaller journals that we don’t publish in much but that collectively are a not insignificant number of papers. Let’s just say that learned societies have some way to go on their open access journey. But if we were to prevent our researchers from being able to publish in these journals this could well deeply affect the learned societies. That’s why I welcome the statement in the preamble document that ‘transformative’ type of agreements which include offsetting arrangements will be acceptable under certain circumstances. The interpretation of this statement by UKRI into their policy will determine which publishers will be acceptable or otherwise. In case such high quality Open Access Platforms or journals do not yet exist, the Funders will jointly provide incentives and support to establish these. This one is potentially problematic because of the perception there will be a restriction on choice of publication options. But that is not necessarily the case. The publishing sector adopted the language of ‘a threat to academic freedom’ this year in relation to the question of funders refusing to pay for hybrid open access. Academic freedom refers to freedom of expression not freedom of choice of publication outlet. This language is again being used by the publishing sector in light of Plan S.
This language is now also being used by the academic sector. In an impassioned post European scientists state that Plan S means researchers are “forbidden to publish in subscription journals, including in hybrid ones, where OA option is available at an extra cost.” This is simply not the case. As described above, not all hybrid is necessarily off the table. The other point that seems to be missed is under Plan S, authors can publish wherever they choose if they deposit the Author’s Accepted Manuscript in an institutional repository under a CC-BY license with a zero month embargo. We are halfway there already in the UK where authors generally are already depositing their work to an institutional repository for REF compliance. The part that requires attention then goes back to the question of the authors retaining copyright over their own work. The question of access to open access publishing options is more complicated. There are many disciplines in which there are very few open access journals at all. These will need specific support especially initially in relation to these policies. Even then this is going to be tricky because establishing a new journal takes time. There are a few precedents, the Wellcome Trust launched Wellcome Open Research in 2016 based on the F1000 platform, and Bill and Melinda Gates Foundation followed suit using the same platform in 2017. But these are unlikely to reassure many of our researchers. There are some serious concerns with Plan S which relate to the equity issue of moving to a pay to publish ecosystem. These are valid and need to be discussed in the broader context of the open research debate. But that is not the theme of the majority of concerns from the academic sector. Those worries about freedom of choice to publish point to the real problem – what is attached to publication. The problem is not Plan S, or open access per se. Publishing in specific journals or with specific publishers is primarily an issue of career prospects rather than of disseminating the work, and has been for a long time. When researchers say that the right to publish in an outlet of their choosing threatens ‘academic freedom’ they are referring to their ability to subsequently succeed in future job applications, promotions and grant applications. It is the academic reward system in which everyone is trapped. Indeed the Plan S preamble refers to a “misdirected reward system which puts emphasis on the wrong indicators (e.g. journal impact factor)”. It commits to “fundamentally revise the incentive and reward system of science” and suggests that the San Francisco Declaration on Research Assessment (DORA) as a starting point. This is the real conversation we need to be having. It is not an easy one to address, but for those who have been arguing for the need to have a serious, international, sector wide conversation about this, Plan S offers a welcome shot in the arm. This is a sister blog to “Relax everyone, Plan S is just the beginning of the discussion” and provides the ‘supplementary material’ to that blog. It discusses the points in the Plan S principles that are not particularly contentious. 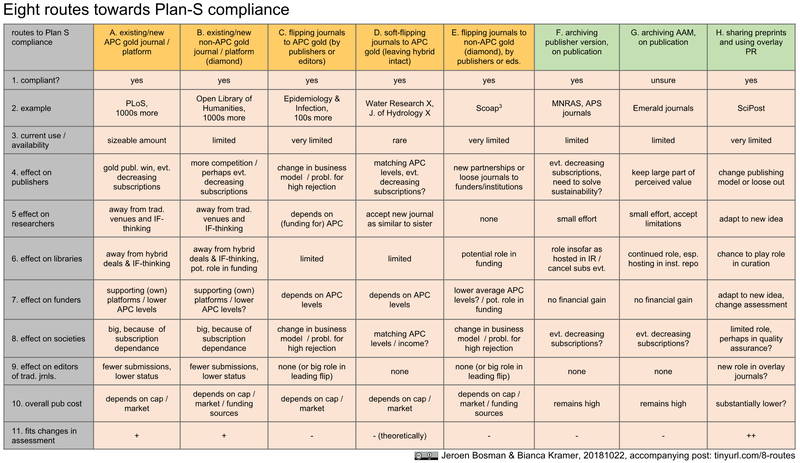 At the end of this blog is a list of links and commentary to date on Plan S.
The Funders will ensure the establishment of robust criteria and requirements for the services that compliant high quality Open Access platforms and journals must provide. This is perfectly reasonable. The amount of money being invested is huge and quite rightly, the funders want to articulate what they are prepared to pay for. It is also helpful from an institutional perspective to have guidelines that clearly identify which journals are compliant and which are not. Indeed, there is a precedent. In 2017 the Wellcome Trust introduced a publisher requirement list stating that compliant publishers needed to deposit to PubMed Central Europe, apply the correct licence and provide invoices that contained complete and understandable information. They asked publishers to sign up to these principles to be listed on their ‘white list’. This point reflects the status quo in the UK at least. Universities across the UK are currently managing open access payments through various funding models. In some instances, such as Cambridge, payments are only made from funds provided by funding bodies with no extra funds provided by the institution. Other institutions such as UCL provide central university funds in addition to those provided by funders. There are a small number of institutions which do not receive any funds from funders but do provide central funds for specific publications. Of course, if journals were to flip to fully open access then funds currently being used to pay for subscriptions could be freed up to divert to expenditure on APCs for fully gold publications. Funders will ask universities and libraries to align their policies and strategies, notably to ensure transparency. While this might be a little tricky simply because of the individual governance arrangements at institution, it is a sensible thing to aim for. The above principles shall apply to all research outputs, but it is understood that the timeline to achieve Open Access for monographs and books may be longer than 1st January 2020. Open Access monographs ARE contentious, don’t get me wrong. But in the context of this statement of principle, there is concession that there is some work to be done in this space. And we already knew that UKRI intends to include monographs in the post REF2021 (as in, anything published from 1 January 2021). Wellcome Trust have had OA monographs in their policy for years. The importance of open archives and repositories for hosting research outputs is acknowledged because of their long-term archiving function and their potential for editorial innovation. Now I know this is contentious for us Open Access nerds because there is a sense that repositories are once again being pushed into the shadows, which is what happened with the Finch report. But as noted in the main blog, under Plan S, deposit of an Author’s Accepted Manuscript into a repository is compliant if it is there under a CC-BY licence and with a zero embargo. In a few instances, the queries or concerns raised about Plan S are actually operational ones. Currently the RCUK (now UKRI) does cap funding to Universities, using a complex algorithm to determine allocations in a given year to support the institutions meeting the open access policy. This has resulted in some institutions (including Cambridge) to identify a preference for publishers exhibiting actions towards an open access future. Manchester University has introduced new criteria for payment of APCs. They support “Publishers who are taking a sustainable and affordable approach to the transition to OA, e.g. by reducing the cost of publishing Gold OA in hybrid (subscription) journals via offsetting deals or membership schemes are listed below:…” They include a list of journals for which APCs will not be paid. The alternative interpretation of this statement will be that individual APCs will be capped. This would have implications for all administrators of APCs. It would have particular implications for Cambridge University because of the relatively high proportion of papers published in expensive open access journals such as Nature Communications. The University would both have to find funds to supplement the cost, and also provide the administrative support for this process. This is where discussions need to happen about redirecting subscription budgets towards open access activities. While Plan S adds some urgency, there is time to have these. The Funders will monitor compliance and sanction non-compliance. This is the statement that has some administrative staff highly concerned. In the end it will fall upon them to ensure their research community is up to speed and doing the required activities. But we have had sanctions for non-compliance to Wellcome Trust policies since 2014 so this in itself is not new. There has been considerable discussion about Plan S – here are just a few links that might be interesting. NOTE this list has been moved and is now being maintained on a separate blog: ‘Plan S – links, commentary and news items‘. STM Association – STM statement on Plan S: Accelerating the transition to full and immediate Open Access to scientific publications. Academic response – Response to Plan S from Academic Researchers: Unethical, Too Risky!